Recently, when I manage some foreign coins, I find that there are 2 medals or toys mixed up with my old coins. I don't have any reference of them. The first one may be come from England. I don't known why they are mede. Anyone with any info for me on these 2 items would be very appreciated. The inscriptions on the obverse of this medal are GEORGE IV KING GREAT BRITAIN. The inscriptions on the obverse of this medal are GEO.&. ? IARLOTTE.CROWD:SEP.SS.1701. I have received comments about these medals from Mr. E.B. , Mr. V. M., Mr. M.D. and my good friend Dr. JSL. I appreciate very much. If you want to share your knowledge and enthusism in numismatics, feel free to contact me please. I have placed below the comments which are self-explained. Thanks indeed to Mr. E.B., Mr. V. M. & Mr. M.D. 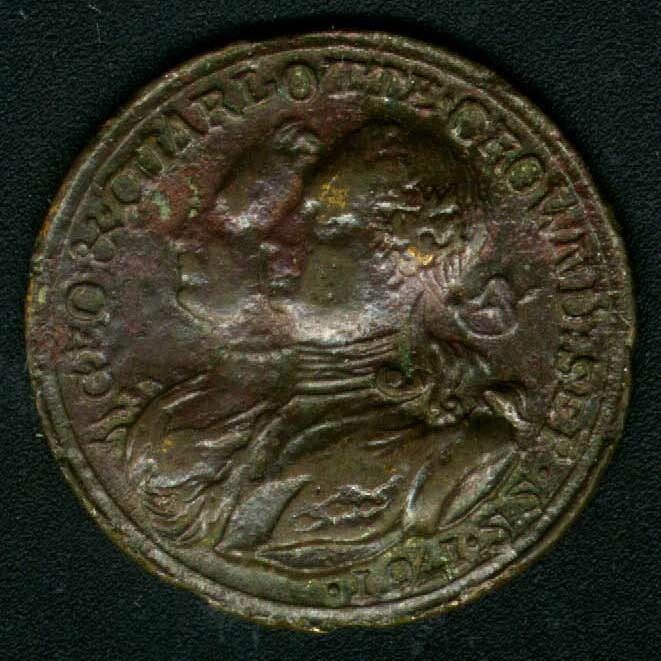 Subject: Re: medal; coin or toy? The first example is of a type of mock guinea that was used as a gambling chip and keepsake. It commemorates the death of the King, but a lot of other examples such as "To Hanover" commented on political issues of the day and "in memory of the good old days" was a victorian mock sovereign. The second piece comments on the marriage of George IV to Charlotte of Brunswick. There was a big scandal because according to some, including George, he was already married to his mistress, Mrs Fitzherbert. Where the 1701 comes into it I don't know. None of these tokens have any great value although most British collectors have a few examples. identification supplied by another person is incorrect. 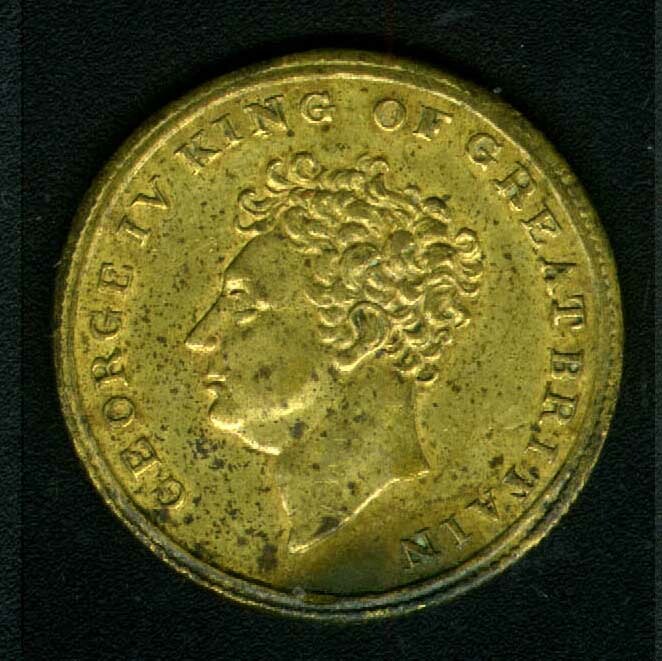 The first is a fairly common brass medallion commemorating the death of George IV in 1830. I'm not sure that it was a gaming token or mock guinea, but maybe so. It is not the usual "Cumberland Jack" which had "To Hanover" on it and came later. The second identification is wrong. 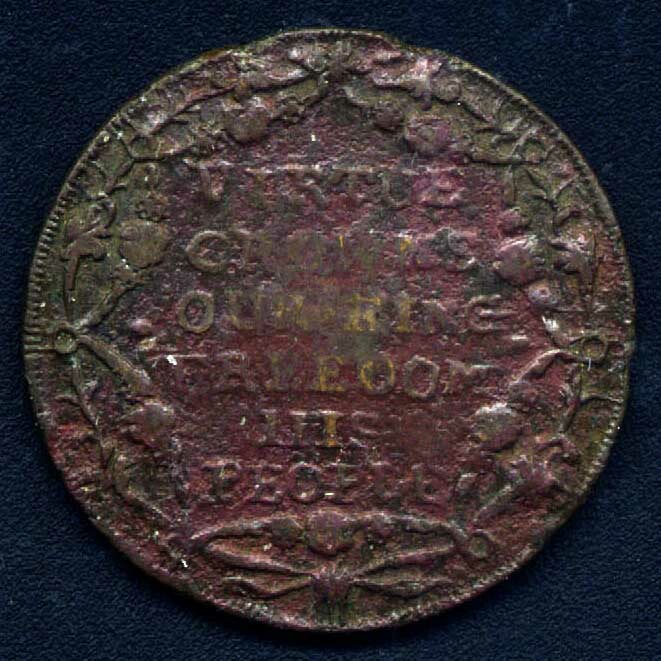 The bronze or copper medallion must be misdated--please check more closely, it isn't 1701 but 1761. This would be a celebration medallion for the marriage of George III and Queen Charlotte. Nothing to do with George IV. I think the reverse inscription is VIRTUE something(CROWNS?) OUR KING, FREEDOM HIS PEOPLE. My guess would make some sense, at least. I found your website through a link someone posted on the Collectors Universe Message Boards. A very nice site, though unrelated to my collecting interests. Imagine my surprised to see two British medals! I suppose these things like money have had travels that would make interesting reading if only they could speak. It happens that both of your medals are listed in Brown's, British Historical Medals, Volumne I. Neither has much information attached to them but I can give you the reference numbers at least. Death of George IV, by T. Kettle. BHM 1388 Issued only in brass and is considered R in a scale from CC (very common), C (common), N (normal), R (rare) through RRRR (extremely rare, less than 5 examples). Probably 100 or less of this piece were struck. It looks very similar to other varieties that are very common. There is a note that says: The figure 2's are reversed in the obverse legend. Below is an Additional comment about No.134 from my good friend Dr. JSL. Thanks indeed! 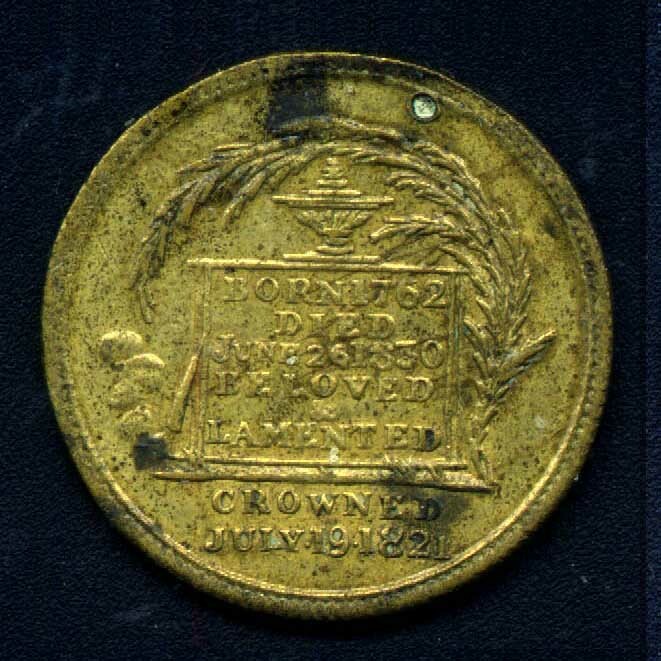 This token, I suppose, could have been distributed to some of the participants in the Kings' funeral. "Beloved" and "lamented" would not be terms otherwise coming all that easily as far as this particular monarch was concerned.